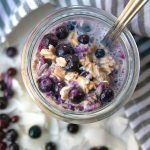 These blueberry overnight oats with almond milk are dairy free, vegan and conveniently made in a jar for breakfast on the go. I was out of everything. Fridge…empty. Shelves…empty. Roommate’s shelves…also empty. And then it came, a glorious box of goodies from home. My mom made sure to get all my home style favorites like the Trader Joe’s penne arrabiata that I couldn’t find in upstate NY. I was also super low on breakfast food. You guys remember those fruit and cream oatmeal packs from back in the day, right? They had a mix flavors to choose from. Well somehow the peaches & cream packets always got left behind in my house. I was a strawberries & cream girl all the way! So in college when I proceeded to open that care package, I was so excited for my favorite STRAWBERRIES to magically appear. But alas, I flipped all the boxes over to see the front label and they were all exclusively peaches and cream. My mom was so excited about finding my berries and cream theme, she completely forget which fruit I liked. We laugh about the infamous oatmeal packets now and she still just remembers the excitement for finding my “favorite” flavor. If nothing else the guy down the hall lucked out with breakfast for the next couple weeks, so YAY for him? I can’t say that I miss that college feeling of hunger and desperation though. Now that I’m a #realadult (well sort of) with the freedom to choose what goes into my breakfast, I tend to stay away from oatmeal packets altogether. It’s not that they aren’t still tasty and nostalgic, the packet version is usually just packed with sugar and powdered milk, both of which aren’t ideal for digestion. Oatmeal on it’s own is a healthy breakfast option, but to keep it healthy, it helps to have control over what goes in it. I always avoided making oatmeal from scratch with old fashioned oats because it requires stove top cooking and constant stirring. But then I discovered the glorious overnight oats trend and was hooked! Step 2: Shake that jar like a polaroid picture! Step 4: Wake up in the morning and tada breakfast is ready. EASY PEASY. And if the idea of cold, soft oatmeal doesn’t float your boat, not to worry! Tim is all about texture when it comes to his food and he wouldn’t touch anything cold or soggy either. If that sounds like you, all you have to do (I do this too!) 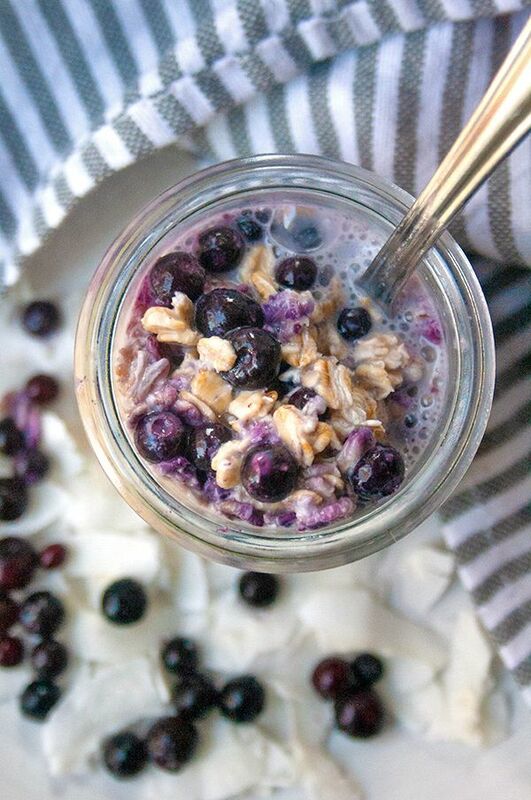 is pop these blueberry overnight oats in the microwave for 2 minutes and you’re all set. 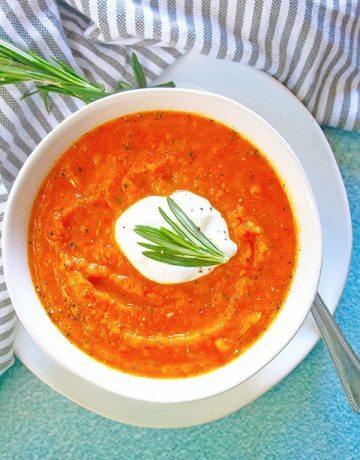 It’ll taste like you hovered over the stove top waiting for oatmeal to cook, but minus the time. Grab your FREE guide to going refined sugar free! These blueberry overnight oats taste great on their own but if you want something a little heartier in the morning, you can make your healthy oatmeal taste extra indulgent. 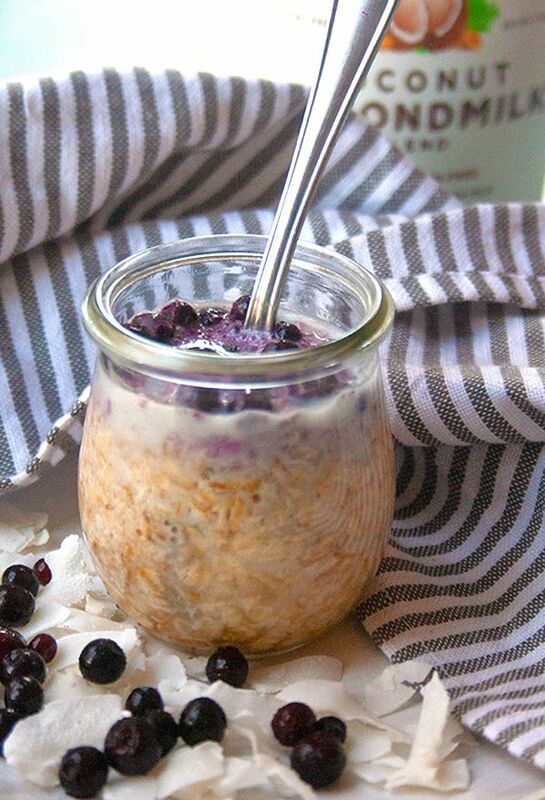 For tropical flair and extra crunch, I like to add unsweetened coconut flakes to these oats. P.S. I intentionally use unsweetened coconut. You can taste the coconut flavor better and if you need extra sugar you can use a natural sweetener like maple syrup or honey. If you’ve never used chia seeds before, they’re essentially like a cross between poppy seeds and tapioca. Note: Be sure to add the chia seeds to your oatmeal the night before with the other ingredients. 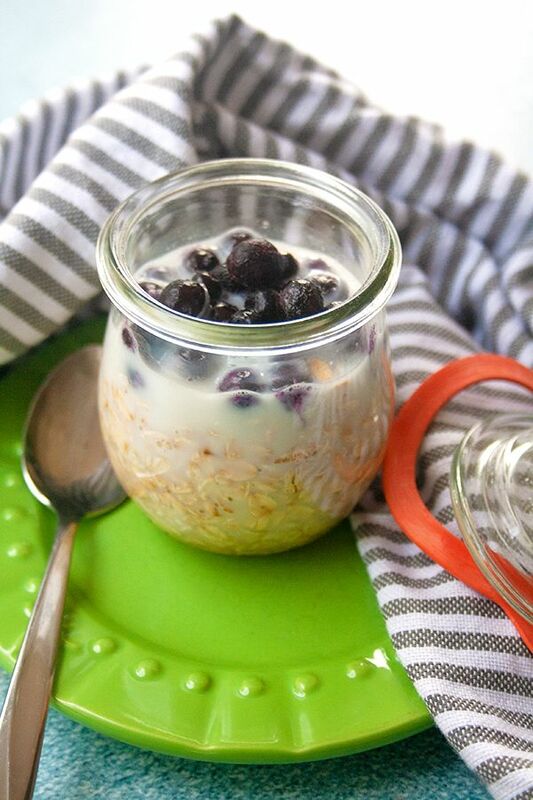 A dollop of yogurt can add a bit of creaminess to your oatmeal, a la the blueberries and cream packet oats. 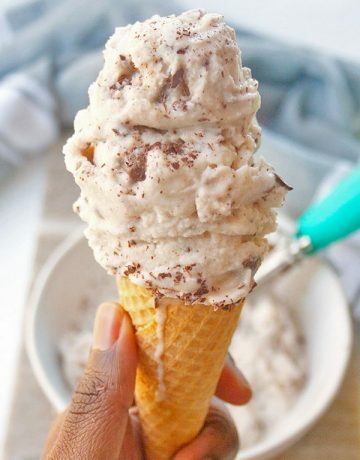 If you’re like me and dairy isn’t easy on your tummy, go dairy-free with coconut based yogurt. Try Coyo brand! It’s my absolute favorite!!! It’s from Australia, thick and creamy like greek yogurt (look for it at Whole Foods). I also really like Coconut Collaborative brand; it’s super creamy but a more standard yogurt texture, not super thick like greek yogurt. Need more breakfast recipe ideas? 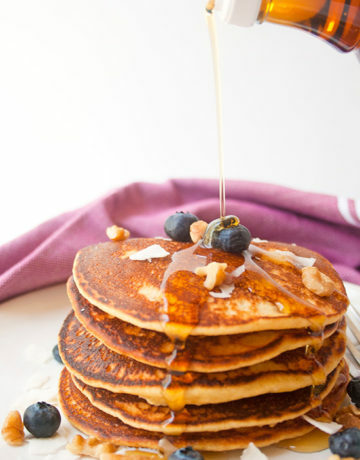 Try my Cherry Walnut Overnight Oats or my Fluffy Blueberry Cornmeal Pancakes! Add rolled oats, cinnamon, milk, maple syrup, blueberries and salt to a mason jar. Seal and shake the jar for 15 seconds and then refrigerate overnight. Eat cold in the morning or microwave for 1-2 minutes until oats are cooked through. Top with your favorite toppings (see post for tips). Enjoy!